Dr. Yang and his team focus on the geo-environmental and geo-disaster engineering related research issues. Three main research directions are summarized in the following table. Dr. Yang's team has conducted many researches and projects on the analysis, design and case study of slopes and earth retaining structures. The aim is to provide better understanding of the performance and failure mechanism of slopes and earth structures subject to natural disaster (heavy rainfall, flood, and seismic loadings). 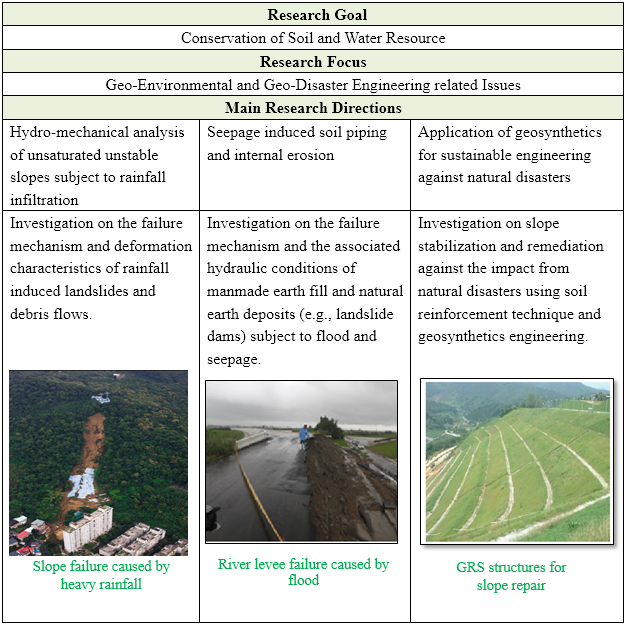 The research results are applied to prevent and mitigate the natural disaster induced damage or collapse of geotechnical earth structures, and to achieve the ultimate goal of establishing sustainable infrastructures and safe homeland.